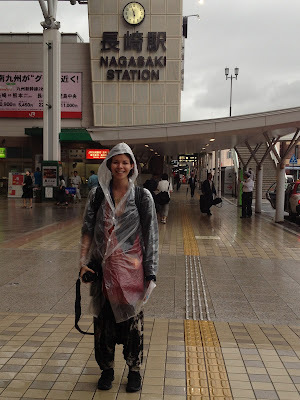 We arrived in Nagasaki in beautiful rainy weather, after taking a ferry from Kumamoto to Shimabara, then train to Nagasaki. We had an issue with overbooking at the hostel, but the hostel owner kindly booked us into another one, and even drove us there. He had an interesting story as well- opening up and running a hostel after traveling and living in South America for whole 5 years. He told us about what his adventures had taught him- to live life slowly and most of all to enjoy it. I think this became part of him, because he stood out with his calm and easy-going vibe, amongst the japanese busy, fast, lifestyle and social expectations. I could relate to what he was saying from my experience in Guatemala, but realized thanks to him, that it is easy to have these reactions, but much more difficult to remember and maintain the way you want to live your life and staying true to it, after coming back to your home-country which may be the completely opposite. He was super inspiring, and we just wish we had more time with him than just 10 minutes in his car. 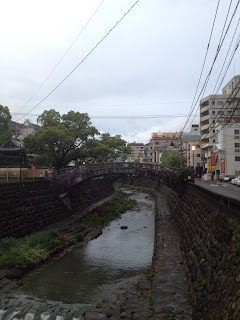 The city of Nagasaki was beautiful- I especially liked the cute stone bridges going across the little streams. 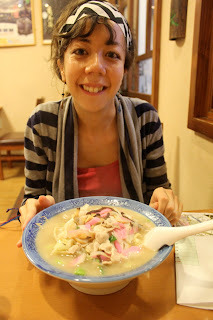 We also managed to eat the specialty of Nagasaki- chanpon and sara-udon. Chanpon is a seafood/pork/vegetable noodle soup, while sara-udon, literally meaning plate noodles, is crispy noodles with vegetables, seafood, and meat in a thick sauce on top. Sara enjoyed her Sara udon, and Monica doesn't sound anything like chanpon but her dish as well. My sister Sara had two requests for our time in Nagasaki. One, was to eat champon. And two, was to see the night view of Nagasaki. In the heavy rain, we made our way to see the so called 10 million dollar view, from Inasayama view place- 333m in altitude. 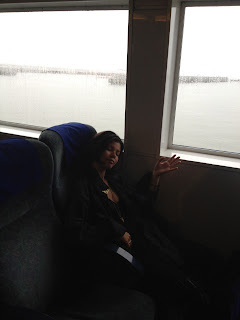 As we went up on the gondola, the view was fuzzy, with the fog caused by the rain. But there came moments where it cleared up and this breathtaking view showed up. The gondola girl let us know that it is because Nagasaki is a city filled with hill and this is why the night view turn out so beautiful. Up at the view place as well, the rain came down heavy and the wind blowing strong, and honestly I think we felt a little miserable in the dark and the wet, but this view made it all worth it. If this were a couple, there was zero romantic points in the particular situation so I think would have either made or break the couple. Luckily for us, this situation just made us stronger as siblings. "Life is not about waiting for the storm to pass, but about dancing in the rain." I would like to have, around me, people with mindsets like this, because tougher moments really define who you are and how you live your life, and I would like to do it laughing and dancing with company.